Overall Views New Yaris comes with a more sporty look, stylish, futuristic and dynamic. This is evident from the curve of the design with sharp corners ranging from front to back. On the front, the grill that blends with the main light to the stern makes the impression more sporty. Coupled with DRL lamps (Daytime-Running Lights) that blend nicely with the grille makes the display more character, plus a black piano lower grille. Special on New Yaris TRD Sportivo, aura racing and sporty reinforced with red line accents on the bumper that makes a special marker on this top type. At the rear of the New Yaris is equipped with a floating roof that reinforces the impression of sporty. Special type TRD Sportivo, equipped TRD sticker and TRD side skirts, also use a black outer mirror so it looks more integrated with the window. At the rear, the layered and thin design of lights with horizontal grooves gives wide effect on the New Yaris look. The design is made as if one with the back door. Impression of sporty looks increasingly prominent on New Yaris TRD Sportivo because now equipped with rear-roof spoiler and diffuser with racing nuances design. New Yaris uses 16 "alloy wheels with two-tone machining to appear in harmony with the overall exterior design. All New Yaris grade is equipped with a shark fin antenna, to be more aerodynamic as well as to strengthen the stylish and modern aura of this New Yaris car. Changes are also made on the interior of New Yaris , especially on the dashboard that is designed more attractive and create a more spacious impression. The center of the front with a more challenging design as a wave of surfing. The use of silver color in some interior ornaments make the atmosphere of the cabin New Yaris feels more modern, as in the front console, speakers, register knob, and AC regulator. New Yaris interior is also equipped with HD Display, DVD, FM / AM Radio, USB, AUX, Bluetooth (audio and phone). Especially for type G and TRD Sportivo, equipped with iPod ready, miracast, weblink, internet connection and multitasking window and remote apps via smartphone. Like the predecessor series, the New Yaris maintains the 2NR-FE engine which has a maximum power of 107 ps and a torque of 14.3 kgm. 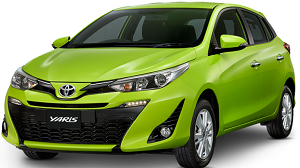 Special New Yaris TRD Sportivo, driving arrangement equipped with SPORT / ECO Mode option. When you want to drive efficiently, motorists can turn on eco mode. While to get a sporty sensation, can use sport mode. Even to further add to the sporty sensation, New Yaris TRD Sportivo CVT is equipped with buttons that can help the driver feel the change of teeth like a racer. New Yaris comes equipped with seven airbags, Vehicle Stability Control (VSC) to stabilize the vehicle at the cornering position. Hill-Start Assist (HSA) to facilitate vehicle control on a hill. Two seatbelt for driver and front passenger and three for passengers at the rear. In the brake, New Yaris is equipped with anti-lock breaking system (ABS), electronic brake distribution (EBD), and brake assist (BA). Special type New Yaris TRD Sportivo equipped with emergency brake signal.